Every time we look at a statue or picture of Mahatma Gandhi, something different catches our attention. His figure and looks are so plain and unimpressive that even minute details can stand out demanding a thought from the onlooker. It was his moustache that caught my attention this year on 2nd October. It looked quite unimpressive in comparison to the much famed moustaches of Hitler and Roosevelt. A majority of famous men do away with moustaches and in India itself the upper class in North India prefer not to have it. Mohandas was educated in England like Jawaharlal and Mohammed Ali. But why did he prefer to have the moustache that Nehru and Jinnah preferred to shave off? Isn't it something to think of? The Mahatma was always like that. As he rightly said his life is his message and there is always something to be asked and answers sought about his life and figure. There are many who believe that the Mahatma became senile towards his end and there are few who believe that he could have even acted against the nation's interests. But the question that none of them find easy to answer is how an average ordinary Indian like him could come up to command the respect of one and all the world over. It cannot be mere luck, manipulation or even a wrong notion. There is only one answer to all such doubts. Mohandas Karamchand Gandhi was the only top Indian leader who looked like, thought like and lived like an ordinary Indian till his very end. All other factors that made him a successful politician, strategist and finally a Mahatma were only incidental. His ordinary moustache indicates his complete identification with the ordinary Indian peasant and workmen. But for his moustache, he could never aspire to become the Mahatma Gandhi that we all know of now. Most of the leaders in our democracy look like us at the beginning of their political career and then slowly start looking unlike us as they climb up the ladder. This chameleon tendency has reached unimaginable limits that we find even older Gandhians dyeing their hair pitch black and always carrying two sets of clothes ' one 'desi' set for the party functions and one 'videsi' set for other parties. Many from the South of India have one set of clothes to wear when they are in their own states and another one when they are in Delhi. Very often we find it difficult to recognise many of them when they are in Delhi. The reach of visual media has made the 'capital life' of all such politicians difficult. The important point most of them miss out is the impact of their 'videsi' visual images on their supporters back home. The opium of the masses in a democracy is trust. If people trust a leader wholeheartedly, they will do anything for him. To win the trust of ordinary people is not an easy task. Indian democracy has proved this seemingly unbelievable phenomenon many times. It is far more difficult to convince rural illiterates than urban literates as far as democracy is concerned. It is in this aspect that Mohandas Gandhi succeeded and became Mahatma Gandhi. The loin cloth and lacklustre moustache provided a meaningful figure for the half naked fakir to walk into the minds of all ordinary Indians. Quite unlike other leaders (then and now) he never changed his looks as he climbed up the steps of 'mahatma'hood. And that remains his uniqueness and sign of undiluted sincerity for all his supporters and opponents to learn from. The greatest weapon in Mahatma's possession was his complete identification with Indian masses. We had leaders before and after the Mahatma who could identify with a specific section of our population for some time. Jawaharlal & Indira could identify with the socialists and Rajiv with the techno-savvy new generation. Lal Bahadur could identify with kisans and Atal Bihari with the progressive middle class. But none of them could identify with the vast majority of Indians who are essentially religious and wanted to believe in something or someone who is genuinely sincere to them. Poor and helpless people are always looking for icons to identify with and Mohandas Gandhi could easily provide the same ever since he switched over from his western dresses to a piece of hand woven cloth and familiar Indian moustache. It goes to his full credit that an ordinary man like Mohandas could generate so much trust by his looks and actions. Ever since he returned from South Africa and walked into the Indian landscape and mind, he never looked back. His loin cloth and moustache remained even when he went to London to negotiate our independence. Even those who do not believe in his philosophy and methods have no choice but to admit his sincerity with whatever he did. Quite in contrast with most of our leaders who deviate in their deeds from their declared intentions, Mahatma Gandhi remained steadfast in his actions for whatever he preached (even if it was counterproductive). Complete identification with whatever he believed in was his forte and unqualified support for his calls was the only option in front of the freedom fighters. Almost sixty years have passed since the Mahatma is gone. Indian nation, which has matured from an oversized colony to an organised democracy, is still struggling with an identity crisis. Now the question that is uppermost in the minds of all Indians is about the efficacy of this type of a democratic government to alleviate poverty and develop a billion strong country within a reasonable time frame. Even after 50 years, we are unable to make any drastic but absolutely essential changes in our constitution. We do not have the type of political leaders who can confirm the backing of the nation for any major changes in our constitution. The leaders do not have the masses with them and most leaders are not trusted by the masses. The simple fact that we are unable to develop an alternative for Satyagraha, which was developed by the Mahatma almost a century ago as a form of non-violent civil protest, speaks volumes about the quality of leadership that followed him. 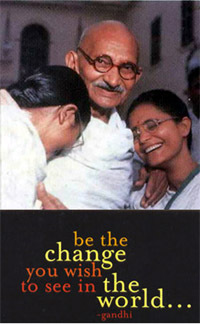 Only another Mahatma with moustache can lead us out of the democratic quagmire that Indians have fallen into. Hey Ram.